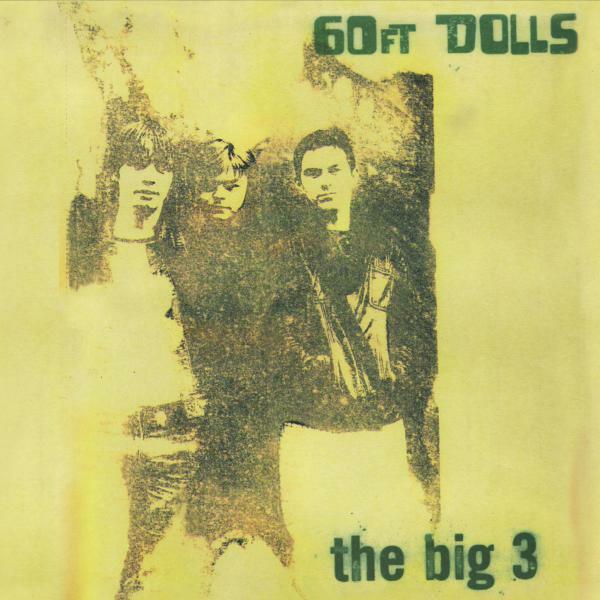 60FT Dolls formed in Newport in 1992, comprising of singer and guitarist Richard Parfitt, bassist and vocalist Mike Cole and drummer Carl Bevan. The band spearheaded the 1990s Newport scene that would become known as “cool Cymru”. Channelling shared touchstones including Dinosaur Jr, The Yardbirds, The Jam, Beatles and Wilko Johnson, their brand of primal, good time rock’n’roll was shot through with a melodic pop sensibility. Their debut single ‘Happy Shopper’ was released in 1994 on local label Townhill followed by a one-off Rough Trade 45, ‘White Knuckle Ride’, after which the band signed to RCA’s Indolent label. Championed by Steve Lamacq, the band’s live chemistry and (quite literally) speed-fuelled performances saw them support the likes of Oasis, Elastica and Dinosaur Jr. Recorded at Rockfield Studios in South Wales, The Big 3 is full-throttle punk shot through with coruscating guitar licks, good time romanticism and underdog refusal to lie down and die. ‘New Loafers’, ‘Talk To Me’ and the brilliant single that was ‘Stay’, are classic R&B/punk, while ‘Hair’ is delicate and sensuous (written with Elastica’s Donna Matthews) and chiming ‘The One’, rounds off a record whose raw, expressionistic aesthetic was at odds with Britpop’s mannered pop. The Big 3 was released in 1996 to strong reviews and made the Best Of The Year lists in the NME and The Guardian, and in 2003 Mojo named it as one of the Top 12 Britpop Albums Of All Time. This 2CD expanded edition includes the original album together with the best of their b-sides as chosen by the band. Also included is their BBC Radio 1 session for John Peel (previously unreleased), which is listed in the Best Peel Sessions Of All Time. It’s a reminder of one of the often forgotten bands of a rich era in British music and a truly lost classic album.